It was 1961. The story continues…. There were now eight ‘West Bromwich Hodgson’s’ firmly established in England. These ‘first-generation’ Jamaican immigrants would eventually be responsible for the creation of the second, third and fourth generation members of the Hodgson clan. During the month of February 1961, a ‘second-generation’ member of the West Bromwich Hodgson’s was born to Jamaican’s Renford & Ivorine Hodgson. That child was me, Robert Roy Hodgson. My two brother’s, three sister’s and many cousin’s arrived too. All the cousin branches would regularly visit ‘Uncle Cecil’ and ‘Aunt Helen’s’ home in Jesson Street. With Helen coming from a religious background, she and Cecil were by this time, members of a nearby 19th century church in Beeches Road – the Anglican Church of Saint Phillip. Working as unpaid volunteers, Cecil became the Churchwarden there, with his wife working alongside him. “A Churchwarden had certain responsibilities. They were expected to lead the parishioners by setting a good example and encouraging unity and peace. He was to maintain order and peace in the church at all times. Churchwardens in many parts of the Anglican Communion were legally responsible for all the property and movable goods belonging to the parish church. Cecil’s eldest sibling, Ida Mae Burkley of New York had never been to the United Kingdom. In the summer of 1961, she came to England to visit her younger brother, and his new wife Helen at West Bromwich. A group photograph of this very pleasant occasion was proudly recorded at the rear of Cecil’s new home. The youngest member, my uncle, Colin Vern Hodgson was not present. The West Bromwich Hodgson’s And A New York Hodgson At Cecil’s. Nephew’s Left To Right From The Back; Shirley, Ainsley, Clinton, Renford, Valdie, Astley. The Elders At The Front; Mae, Cecil And Helen. Photo Taken 1961. 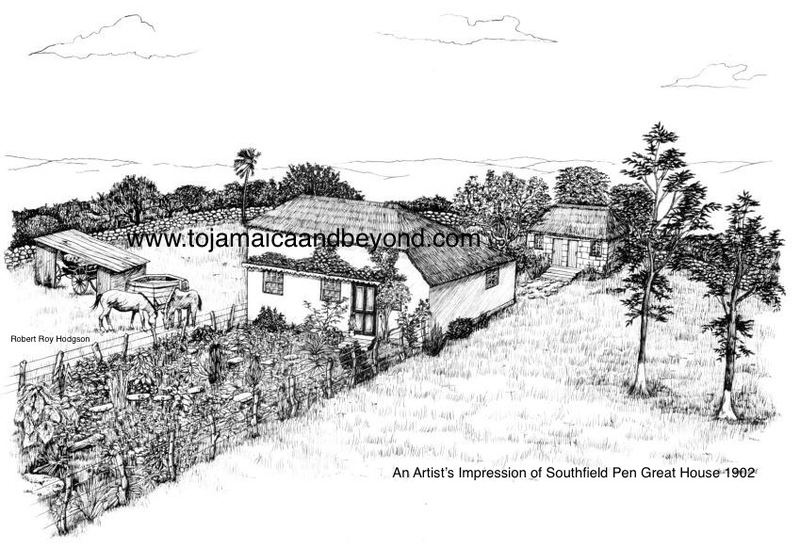 Mae, who had left Southfield in 1923 to go to the United States, had never met any of Cecil’s nephew’s before, they all being born after she left Jamaica. At West Bromwich, Mae met her Southfield nephew’s for the first time. Dad said she also saw me as a baby. Whilst at West Bromwich, Mae – who was the eldest child of the late Mabel and Mass Teddy – spoke to everybody about the wealthy ancestral background of the family. “The Hodgson’s should have been rich” she commented. A subject that would almost certainly have been discussed amongst the fellow Jamaican’s was the upcoming independence of Jamaica which was due to take place on the island the following year, 1962. West Bromwich Dartmouth Cricket Club. Cecil Played Here. The Business Houses league team were in deep trouble, having lost 4 wickets and scoring just 4 runs! Then came in Ainsley Hodgson. Described as the ‘Black Bradman’ he confidently strode on to the pitch and saved the day for his team, scoring a quick-fire 129 runs in just 110 mins, hitting five sixes and seventeen fours! Twenty year old, Ainsley Hodgson (aka Piggy) was an exciting player who had been playing for the Tube Products works team alongside his three cousins, Valdie, Renford and Clinton for the last two years, having first joined Tube Products cricket team in the August of 1959. A local newspaper reported on the talented Hodgson’s. Ainsley and Clinton at Tube Products. I believe it is in fact Ainsley and my dad, Renford? The Sports Argus Newspaper, July 1961. “Another blog that I thoroughly enjoyed researching. I’ve worked very hard over the last few months, I needed a break. The beginning of this blog was written in England, the finishing touches were written just last night, sipping Sangria on my balcony on the beautiful Spanish Island of Majorca. It’s hard to believe that the little boy born in 1961 would later go on to become a historian researcher of the Southfield Hodgson’s. One of my favourite photographs that I found at Southfield in 2004 was Mae’s visit to England the year that I was born. Everyone dressed in their best attire, Cecil, the elder statesman, in the centre of the photo, his sister with her hand proudly resting on his shoulder. Researching and revealing the cricketing talent of ‘The Fantastic Hodgson’s’ was very interesting. I knew that Ainsley, my dad and his brother’s, Valdie and Clinton all used to play cricket but I was unaware that Uncle Cecil did. I was aware that uncle Clinton was an excellent player. Although he continued to play until a late age, I never actually saw him or any of the others ever play, which is such a shame. I’m quite sure that dad would have prefered all of his boys to have played cricket instead of football! Robert Roy Hodgson. Nice to read another installment of your family history, Robert. Thanks for reading and commenting on my blog Val. Sorry for the long delay getting back to you, I have put everything on hold for the last few months due to to being overworked during the heatwave we have been suffering over the last two months. I am now just beginning to catch up on blogs and messages that I have missed. I’m back! It’s okay. I had a blogging break in the interim and yeah, it’s been horribly hot! Thank you for your efforts. I’ve learned so much about my paternal family.